So I have great news to share. B passed our first choice for his high school and we are beyond ecstatic because I also found out that we may be getting a small discount. Big or small, a discount is a discount and this matters especially when I found out how much his tuition is. One moment I was so happy he passed and the next moment I felt like crying because of the high tuition fee. Thank God there are so many ways that we can save up and scrimp on things without sacrificing valu which is something that National Book Store happens to believe in. Every year, there are only 2 places that I go to so we can complete all of B's school requirements. One of them is Divisoria and the other is National Book Store. Thankfully this year, they have the Grand Back to School Fair. 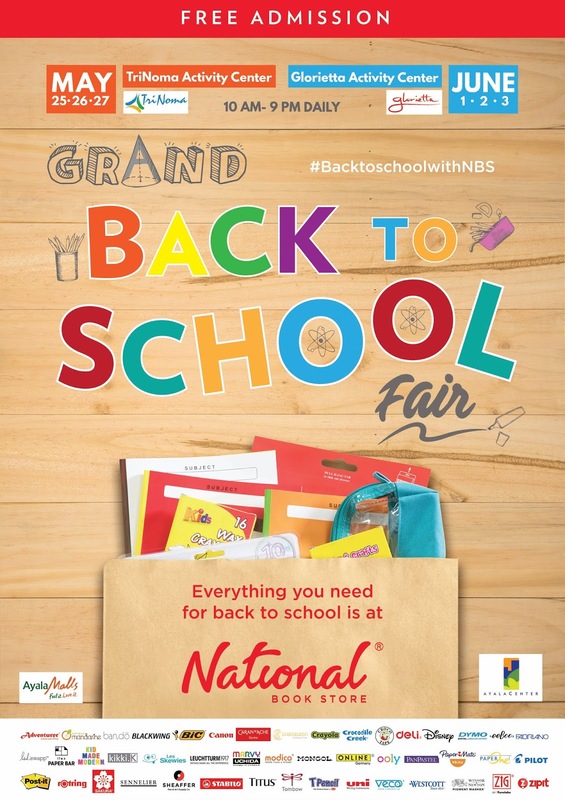 National Book Store invites you to complete your back to school shopping at their Grand Back to School Fair, happening from May 25 to 27, 2018 at the TriNoma Activity Center and from June 1 to 3, 2018 at the Glorietta Activity Center. Everything you need for back to school will be available at this event. You can get a free tote bag for every P1,000 worth of purchase, or get a drawstring bag for P99 for every P300 worth of purchase, or get a lunch bag for P75 for every P500 worth of purchase of participating items. For quick, easy, and convenient shopping, you can get the Grab & Go packs, starting at P145. There are also Backpacks to School, conveniently filled with the essentials every young learner needs like brown envelopes, notebooks, pens, pencils, and more. Two kinds are available: one for Grades 1 to 3, available for P329, and one for Grades 4 to 6, available for P399. More great finds await! Registration starts at 10:00 am and continues throughout the day. Admission is free. This event is made possible thanks to the participating brands: Adventurer, Avenue Mandarine, ban.do, Blackwing, Bic, Canon, Chameleon, Crayola, Crocodile Creek, Croco Tape, Deli, Disney, Dymo, Eeboo, Fabriano, Heidi Swapp, IFEX, kikki.K, Les Skewies, Leuchtturm1917, Marvy Uchida, Modico, Mongol, Online, Ooly, PanPastel, Papermate, Paper One, Pilot, Post-it, Rotring, Sakura, Sennelier, Sheaffer, Stabilo, Titus, Tombow, T-Pencil, Uni, Veco, Westcott, Winsor & Newton, Zig, and ZipIt. Share your back to school hauls with the hashtag #BacktoSchoolwithNBS. Connect with National Book Store on social media - @nationalbookstore on Instagram, and @nbsalert on Facebook, Twitter, Viber, and YouTube. They may also be contacted through their delivery hotline 8888-627, or online at www.nationalbookstore.com.